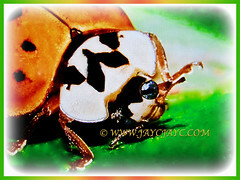 Harmonia axyridis is a typical coccinellid beetle in shape and structure, being domed and having a smooth transition between its wing coverings, pronotum and head. It ranges from 5.5-8.5 mm in size. 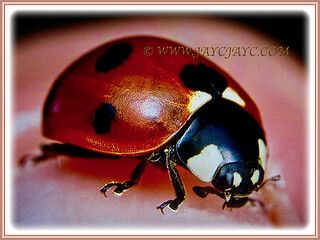 The common colour form is orange or red in colouration with 0-22 black spots of variable size. The other usual forms are uniformly black with 2 or 4 red markings respectively. The pronotum is white with variable black patterning, ranging from a few black spots in an M formation to almost entirely black. The underside is dark with a wide reddish-brown border. This beetle has good eyesight and will come back from where it was removed, and is known to produce a small bite if provoked. Range: It is native to eastern Asia from central Siberia, Kazakhstan and Uzbekistan in the west, through Russia south to the Himalayas and east to the Pacific coast and Japan, including Korea, Mongolia, China and Taiwan. Habitat: In their native Asian habitat, these insects fly to cliffs and rock outcroppings each fall where they overwinter in large numbers. In the absence of such areas in U.S., the beetles seek out sunny sides of tall or prominent buildings during fall. 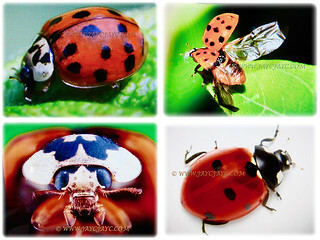 Lady beetles are particularly attracted to buildings that have contrasting dark and light areas. Because the beetles feed on aphids in trees, buildings adjacent to wooded areas are more likely to encounter large numbers of multicolored Asian lady beetles than buildings in open areas. Once lady beetles reach buildings, they crawl into cracks and gaps around windows, doors, roof lines, and other openings. Some continue to move inside the structure until they reach the living areas of homes where they soon die. Others will find suitable overwintering inside wall voids, attics, and other areas, sometimes forming large living masses of insects. 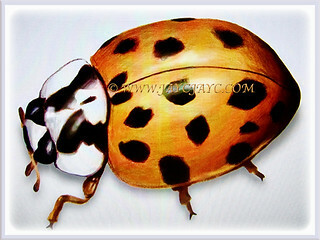 Breeding: The eggs of Harmonia axyridis are approximately 1.2 mm in length and yellow in color. Just before hatching, eggs darken to a gray or black coloration. The larvae of Harmonia axyridis have long bodies and are black with orange coloration (including two long orange lines on the dorsal-lateral areas of the abdomen, which start to develop after the first instar and are complete by the fourth and final instar). They have double-branched spines (scoli) running down the length of the body. The larval stages often grow longer than the final adult individual, starting at an approximate length of 1.9 to 2.1 mm in the first instar and growing to 7.5 to 10.7 mm in the fourth instar. Larvae vaguely resemble tiny black and orange alligators. Pupae are exposed and generally shaped like an elongated dome, often attached to leaves. They tend to be orange, with the fourth instar exoskeleton still attached at the point of substrate attachment. 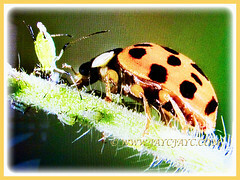 Feeding and diet: In Asia, multicolored Asian lady beetle feeds primarily on aphids found in trees. In U.S., they feed on aphids not only in trees but also in agricultural crops and gardens. In fact, the Multicolored Asian Lady Beetle is an important predator of soybean aphids, a serious pest of soybeans in Minnesota and other Midwest states. It is a voracious predator that is used as a biocontrol agent for aphids and scale insects. As a result, it has been introduced into greenhouses, crop fields and gardens in many countries. Wikipedia on the Asian Lady Beetle.